We first tried these tacos a couple years ago after Brandon got his Big Green Egg and was looking for fun recipes for his grill. We couldn’t get over how flavorful and different the tacos were. The recipe came from The Barebcue Bible by Steven Raichlen. We have a couple of Steve’s books and they are fabulous for getting inspiration for different recipes for the grill. Also, his recipes provide very specific grilling instructions so they’re perfect for both the experienced griller who’s looking for different recipes and for the novice griller who’s learning that grilling is more than flip, flip, poke. According to Steven, this dish is commonly found in Mexico and traditionally served with guacamole, spicy salsa and corn tortillas. The adobo sacue has a nice gentle heat but is not overwhelming. It’s such a nice twist on your traditional taco. Switch it up and try something new on the grill this summer! If using the chiles, tear open and remove the veins and seeds. Soak in the vinegar for 30 minutes, or until soft. Combine the chiles (or chile powder), vinegar, garlic, salt, pepper, oregano, cinnamon and cloves in a blender and process into a smooth, wet paste. Cut the pork loin into four broad, thin (1/4 inch thick) sheets (butterflying them). Spread each piece of pork with adobo mixture and stack in a glass baking dish. Cover and let marinate in fridge, 4 to 6 hours. Preheat grill to high. Oil grill grate, arrange slices of pork on hot grate and grill, turning with tongs, until browned and cooked through. This should take around 2-3 minutes per side. Internal temperature should be 145-15o when you pull it. Let pork rest for a few minutes before slicing. Serve with tortillas, guacamole and salsa. 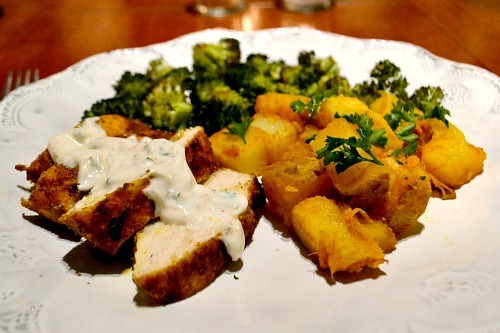 This recipe has been starred in my Google reader since October 3, 2009. Every time I scrolled through my starred recipes I would think, “oh that looks good, I need to make it soon.” And it finally made it on to the menu plan this week! Artichokes are one of my all-time favorite “special” vegetables and stuffing a burger with artichokes and cheese just sounded perfect. The verdict? 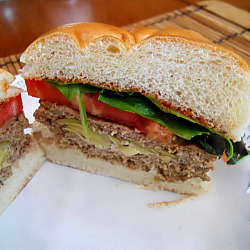 I am glad that I made these burgers nine months after originally staring them! They were an awesome change from traditional burgers. The original recipe used fontina but suggested subbing feta. I had a big block of feta in the fridge so I went with that. The feta was delicious! The only negative about the burgers is that they were a little hard to work with. The turkey was difficult to shape – the mixture seemed really wet. Brandon was concerned about getting them on the grill but they ended up grilling nicely and firming up. Overall, I would recommend these burgers to anyone looking for a twist on traditional burgers or looking for a lower fat (or red meatless) option. We might try the burgers with ground chicken next time! Mix together turkey, onion, balsamic, garlic, salt and pepper in a medium bowl. Form three or four patties (depending on the size of your buns and keeping in mind that the burgers will cook down a bit on the grill). Place patties on a plate and remove the top third of them. Create a small well and place an artichoke heart quarter and one ounce of feta in the well. Replace the meat you removed on top of the filling and seal the edges. Heat grill to medium. Cook burgers about 8-10 minutes per side, or until a thermometer registers at least 160 degrees. Be careful placing the burgers on the grill and try not to move them around much (so they keep their form). I have been all about Josie’s blog, Pink Parsley, lately. I think we have really similar cooking/eating styles and I’ve just gotten so much inspiration from her the last few months. I’m pretty sure that I have at least 10 recipes from her blog starred in my Google Reader right now. I’m having so much fun cooking things that are not from Gourmet even though I have made two recipes from The Gourmet Cookbook since 68 Days of Gourmet ended! Our standby preparation for grilled chicken is simple – olive oil and a Dizzy Pig rub. I thought that this recipe would be a fun way to mix up our grilled chicken and use rosemary from my new herb garden (which I’m proud to say I’m keeping alive – I’m remembering to water the herbs and keeping the little plants happy!). I placed the chicken in the marinade before work and later that night Brandon grilled it on the Egg while I prepared goat cheese mashed potatoes and roasted broccoli. The only changes I made to the recipe were slightly increasing the rosemary in the marinade because I just love it so much and using chicken breasts instead of thighs. A simple and delicious dinner. I will definitely be keeping this simple marinade in my repertoire! Combine the garlic, oil, mustard, vinegar, honey, salt and rosemary in a shallow dish or large ziploc bag. Add chicken and turn to coat. Marinate, chilled, for at least one hour or up to 24 hours. Prepare grill and heat to about 350-375. 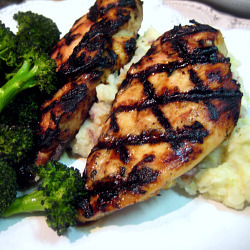 Grill chicken breasts about 8 minutes per side or until an internal temperature of 160 has been reached. Remove chicken from grill, cover with aluminum foil and allow to rest 10 minutes. Before serving, top with the juice from half of a lemon. 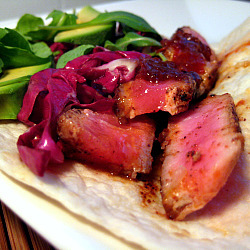 These Chile Crusted Tuna Tacos felt like a great choice for a warm spring night. They were a light and refreshing dinner paired with sangria and Black Bean and Quinoa Salad. Tuna is one of our favorite fish choices and I was eager to try it in fish tacos instead of our usual Asian preparations (like this and this). Although the recipe required preparation of several different elements, it still felt relatively simple to prepare. I was able to take my time with each of the steps and enjoy dicing, simmering and sautéing. 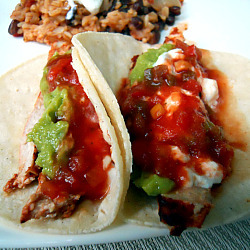 The end result was a tasty twist on fish tacos – sweet, spicy, crunchy. Yum! I was disappointed that I was not able to use the jicama that the recipe called for. It was mushy and moldy at the store. 😦 I ended up making a game-time decision to sub purple cabbage for some crunch. It worked but next time I would definitely do the jicama. If you’re a fish taco lover or looking for a warm weather spin on tacos, these are a great option! Bring orange juice, chipotles and vinegar to a boil in a small heavy saucepan. Reduce heat and simmer, stirring occasionally, until reduced to a generous 1/3 cup, about 15 to 20 minutes. Remove from heat and cool. Toss jicama with cilantro, lime juice, remaining tablespoon oil, and salt and pepper to taste in a small bowl. Refrigerate until ready to use. While sauce cools, prepare charcoal or gas grill for cooking. If using a charcoal grill, open vents on bottom of grill, then light charcoal. Charcoal fire is medium-hot when you can hold your hand 5 inches above rack for 3 to 4 seconds. If using a gas grill, preheat burners on high, covered, 10 minutes, then reduce heat to moderately high. Alternatively, you can sear tuna in a skillet over medium-high heat if you need to cook indoors. While grill heats, stir together coriander, cumin, chili powder, black pepper and kosher salt in a shallow bowl. Brush tuna on all sides with olive oil and coat evenly with spice mixture. Grill tuna on lightly oiled rack, uncovered, turning once, until seared on outside but still rare in center, about 2-3 minutes per side. Let tuna stand 10 minutes. 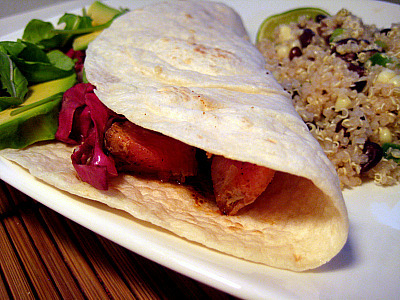 While tuna stands, heat tortillas on grill, turning over once, until warm, about 1 minute, and keep warm, wrapped in foil. Halve, pit and peel avocado and cut into 1/2-inch-thick slices. Alternatively, sear tuna in pan for 2-3 minutes per side over medium heat and heat tortillas in microwave for 20-30 seconds. Put a tortilla on each of 4 plates. Divide arugula, jicama mixture and avocado among tortillas, arranging evenly down center of each. 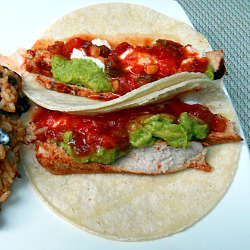 Slice tuna 1/4 inch thick and divide among tacos. 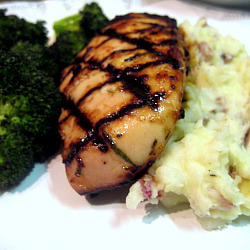 Drizzle orange chipotle sauce evenly over tuna and serve. 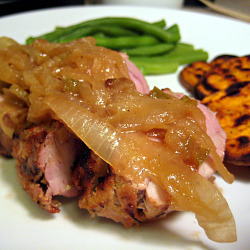 An awesome grilled pork tenderloin to celebrate the first 80+ degree day of the year! It’s been such a cold winter and our recent bout of Spring weather is energizing and refreshing. Brandon, Sullie and I went for a run after work today and then came home and got to work on this delicious dinner! I will only buy pork tenderloin when it is on sale and lucky for us it was on special this week. I remembered seeing this recipe and thought it would be a great for Spring grilling. This pork would have been great grilled with the marinade alone but the addition of the jalapeno onion marmalade really took it over the top. It was so easy to have Brandon outside grilling the pork tenderloin and our favorite grilled sweet potatoes while I worked on the marmalade and green beans. Teamwork! Quick update on the fitness front. First, workouts have been solid this week. I’ve taught BodyPump 3 out of the last 4 days (teaching the new release – BodyPump 73!) and also squeezed in yoga and some runs. Feeling strong but getting a little tired towards the end of the week. Legs are pretty dead and my back is really sore. Still hoping to fit in one more yoga practice tomorrow morning before hitting the road this weekend. We’re going to visit my grandmother to celebrate her birthday and Easter! Combine all ingredients in a food processor and pulse until smooth. Season to taste with salt and pepper. Combine pork and marinade in a large resealable plastic bag. Squeeze out excess air and marinate 12-48 hours. Preheat grill to medium-high heat. Remove pork from marinade and let excess drip off. Cook about 4 minutes per side (4 sides) until internal temperature reaches 145-150 degrees. Remove from heat and let rest for 5 minutes (resist the urge to cut in – let the temperature continue to rise and the juices redistribute). While the pork is grilling, cook onions over medium heat in a large heavy skillet until softened, about 5 minutes. (I used cast iron – always do to caramelize onions!) Season with salt and pepper. Add jalapenos and cook for 1 minute. Add honey and cook another minute, stirring frequently. Add vinegar and simmer, stirring until almost all liquid is evaporated. Add water and simmer, stirring, until slightly thickened and onions are very tender, about 10 minutes. Season marmalade with salt and pepper. Cut pork into slices and serve with marmalade. One of my favorite things to do is stay in on Friday night and cook a nice dinner. I’m usually pretty tired from a week of working and enjoy hanging out at home, cooking and watching a movie. We save going out for Saturday nights. Brandon commonly requests steak for our Friday night dinners. He used to love filets but since getting into grilling his favorite now is bone-in ribeyes. Filets were on sale at the grocery Friday so I decided have Brandon grill them and I’d make a nice sauce. We love sautéed mushrooms with grilled steaks so I decided this recipe for Filet Mgnon with Mushroom Sauce from Gourmet sounded perfect. The combination of the bacon and mushrooms in this sauce was great. The bacon really added an extra element of depth to the sauce and the lemon brightened it up. It was very simple to put together and holds well if your steak isn’t ready yet. The sauce was a nice addition to the grilled filet. 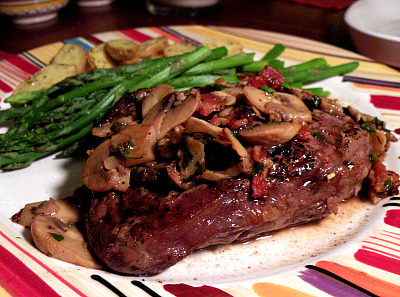 I served our steaks with steamed asparagus and roasted fingerling potatoes. A perfect dinner for two! Cook bacon over medium heat in a heavy 8-inch skillet (cast iron if available) until crisp. Transfer to a paper towel and pour off excess fat from the skillet. Crumble bacon and reserve. Add 1 tablespoon of butter and garlic to skillet. Cook until butter is softened and then add mushrooms and salt and pepper, to taste. Cook for about 10 minutes, stirring frequently, until liquid from mushrooms begins to evaporate. Add brandy and boil until nearly evaporated. Stir in water, lemon juice and Worcestershire sauce and boil until sauce is thickened slightly. Transfer sauce to a small saucepan and stir in reserved bacon and parsley. Keep sauce warm. Pat filets dry with paper towels and generously salt and pepper. If you’re cooking steaks in skillet, heat remaining 1/2 tablespoon butter over medium high heat and sauté filets for 4 minutes. Sear sides slightly and turn filets over. Sauté 3 to 3 1/2 minutes more for medium-rare meat. Internal temperature should be 125 degrees. Let steak rest for about 5 minutes before serving. For the grill, preheat the grill to 400 degrees. Cook steaks for about 4-5 minutes per side, rotating half way through on each side if you want grill marks (a 45 degree turn). Pull steaks when they’ve reached 125 degrees for medium rare. Let rest 5 minutes to allow juices to redistribute. Divide filets between 2 plates and spoon sauce over them.